B U B B L E G A R M: Not so much of a Tartan Tale.. This evening I got The Faerie Glen lipstick from A Tartan Tale and so far I'm loving it. It's a lovely nudie colour that I've not tried in natural light yet, so tomorrow will be the big test, but in my bedroom, it looks pretty good so far! 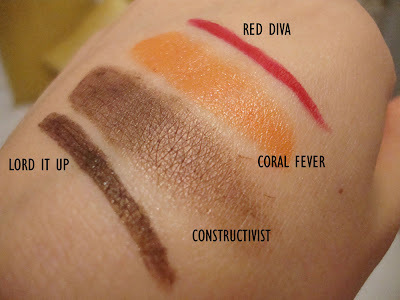 I love Constructivist paint pot :) one of my favourite MAC items for sure! I not sure about the A Tartan Tale either, not seen anything I like. Loving the H&M Home, thanks for the heads up. a tartan tale doesnt really attract me. I havn't been to check it out myself but nobody has raved about it that much. I prefer to do tartan style nails lol. more interesting! Did they have the Tartan bears in MAC? I think that drawstring bag is really cute! Great stuff! I am skipping the Tartan line too, though I'm excited about Cham-pale. Constructivist is one of my absolute favorite products! I picked up Cut a Caper and The Faerie Glen - both are lovely and I'm really happy with them! Overall, though, definitely disappointed with this collection. I hauled BIG TIME from last year's holiday collection! I love the H&M home range, laods of glamorous girly stuff lol. The Tartan Tale range doesnt really appeal to me, I dont know why, I thought it looked a bit boring. The only thing I have seen that I might like to pick up is the Faerie Glen lipstick? Absolutely love the cushion covers!! wow! is it London only?? Oh, and for the H&M stuff, you should come to visit Finland! Hi sweet, I love H&M Home too. Ok, you make me want to buy Lord it Up, just to pair it with my Constructivist, they'd make a beautiful combination!!! Love all your home stuff, you have great taste (but that's not new ofc)! Hehe! I have to admit I hate the green tartan packaging!! So I am surely going to skip this collection. I love the H&M Home section though! Great buys hun, I have Lord it up & Undercurrant on my list aswell as Highland Honey. What did you think of the lipsticks? I was interested in Cut a caper & The Faeire Glen. Thanks for the heads up about the Tartan collection, I was thinking about getting something but I really do need to cut down on the make-up. I love those pillowcases! I will have to go to H&M now! And ditto on the Tartan Tale collection...I wasn't impressed. I love the H&M home collection! You have great taste!